After the ketchup experiment, I decided that I needed to try something more heavy duty to pull the yellow stains from Cupid's tail. 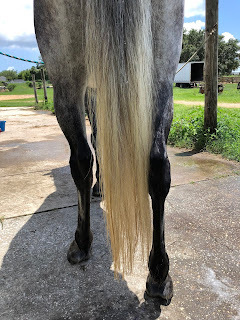 While picking at her tail I did realize that sections of hair at the top are growing in "blonde" so it is very possible that the bottom section is naturally blonde. But because there was fading from the ketchup, I do believe that the yellow is staining. Today's experiment consisted of V05 strawberry shampoo and conditioner, and Dawn Dish Soap (the blue bottle). 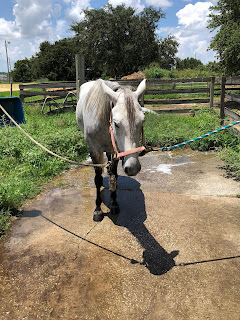 I know several people who use Dawn as their primary shampoo for their horses but have never tried it myself. I do keep a large bottle in my tack locker for bucket and bit cleaning purposes. To start I soaked Cupid's tail with water and spread the strawberry shampoo through it. This was then combed through to remove as much surface dirt as possible. The shampoo smelled great and really got all of the surface dirt out, but did not do anything to remove the staining. 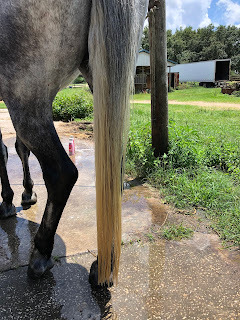 After the shampoo was fully rinsed off I coated Cupid's tail with Dawn, avoiding her tailbone. This created a ton of lather that I used on her feet. Lately, we have been having issues with scratches and I wanted to remove the excess grease from the ointment. 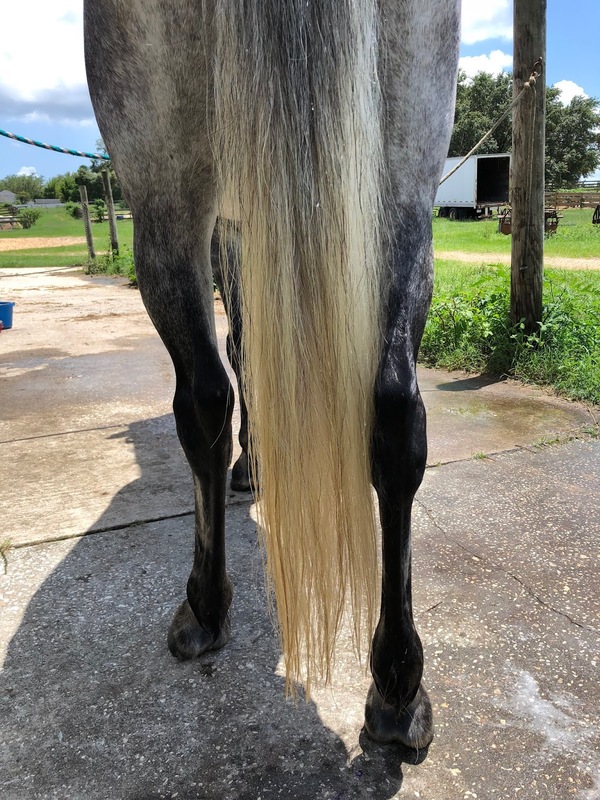 I allowed the Dawn to soak into her tail for approximately 10 minutes while I soaked her hay cubes and conditioned her mane with Cholesterol Cream. Rinsing the Dawn from her tail did take forever. The suds kept bubbling off the tail which did make me a bit nervous about possibly leaving too much residue that would attract dirt. Once the Dawn seemed to be rinsed out completely I coated her tail in the strawberry conditioner to restore moisture. 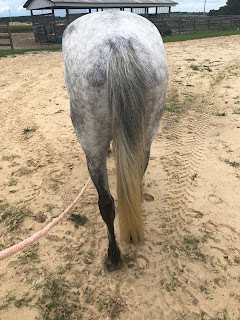 While massaging the conditioner into the tail I discovered that there was still Dawn in the tail. Yay for soap suds mixed with conditioner. I left the conditioner sit while I put away our tack and then rinsed it out. Thankfully the conditioner and the remaining bits of Dawn completely rinsed out within a few minutes. I left Cupid to dry on the cross ties. Once fully dry, I sprayed the usual hair moisturizer onto her mane, tail, and coat. Overall the Dawn did seem to remove some of the staining from Cupid's tail. It was not a miracle product but it was good enough that I would use it again. I do believe that it dried out her tail a bit more than desirable, but it was not as brittle as it had been when I first got her. As you can see we're slowly getting the tail back to a clean and acceptable color, but it's a long process due to the amount of staining I allowed to build up.